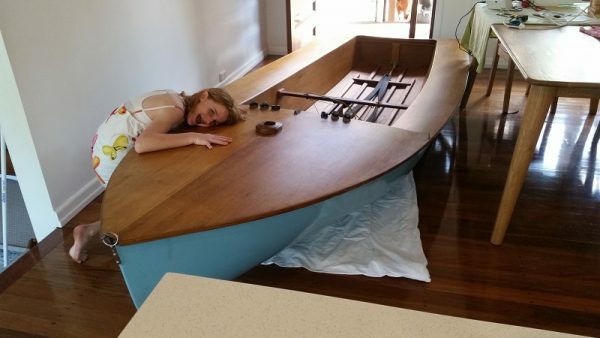 Just your regular sailing dinghy in the dining room — nothing to look at here! 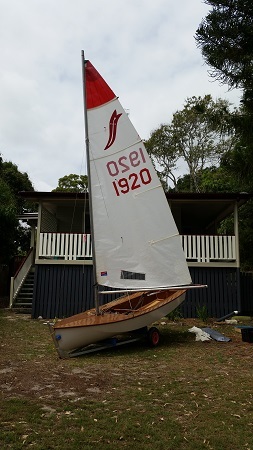 I purchased this wooden Sabre (1638) sailing dinghy in Toowoomba and brought in back to our house in Brisbane. I needed to store it out of the weather for a few weeks before taking it up to our shack at Boreen Point. No, I did not store it in the dining room! The dining room was a temporary resting place — my daughters helped me pick up the Sabre hull and carry it on its side through the front door. We rested in the dining room before picking up the boat again and carrying it over the kitchen bench and out the back door onto the back deck where it would be protected from the weather. That is the great thing about Sabres — with a minimum hull weight of only 41 kg, they are very easy to pick up and move around! 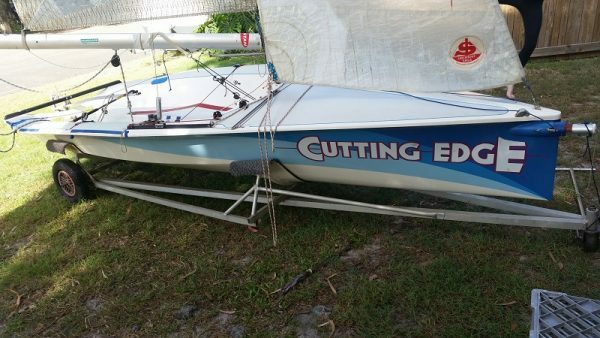 This entry was posted in Sailing and tagged My Boats, Sabre, Sailing Dinghy on 12 November 2017 by Rex. I purchased this wooden Sabre (1920) from a guy in Northern New South Wales who built it. The boat is well constructed, but very light and a pleasure to sail. The wooden boat always attracts an admiring crowd at the beach when I am rigging, launching and retrieving it. 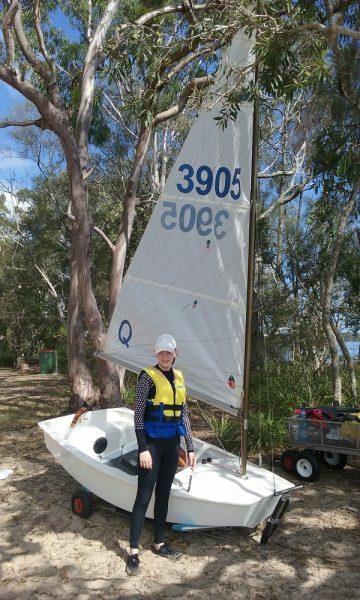 This entry was posted in Aqua Marine, Sailing and tagged Aqua Marine, Boreen Point, Lake Cootharaba, My Boats, Sabre, Sailing Dinghy on 8 October 2017 by Rex. I went up to Lake Cootharaba to do some maintenance work around Aqua Marine. The magic winter weather enticed me to pull some of the boats out on the front lawn to do some work on them too. Unfortunately, there was not enough wind to go sailing though. 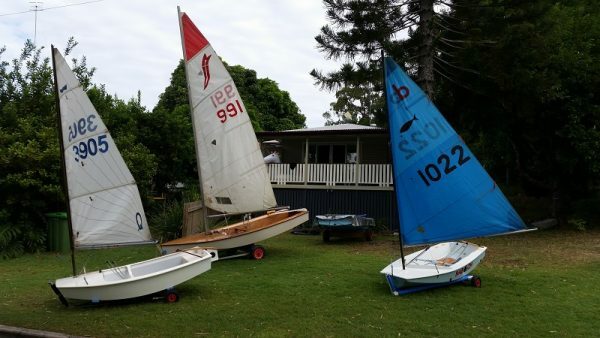 This entry was posted in Aqua Marine, Sailing and tagged Aqua Marine, Boreen Point, Lake Cootharaba, My Boats, Sabot on 28 July 2017 by Rex. If you are staying at Aqua Marine and bringing your own boat, following are a few places to launch. We have framed a Camtas Boating and Recreational Guide map of the Noosa River and Lakes (including Lake Cootharaba) and hung it on the wall of Aqua Marine for reference by guests. Danger! If you use the front lawn of Aqua Marine as a rigging area, be aware that there are powerlines and overhanging trees. We just fit the MG14 and Sabre masts under the powerlines in front of the property! Beware! Aqua Marine is on the northern side of the Boreen Point township so the launching areas are in relation to the house location. 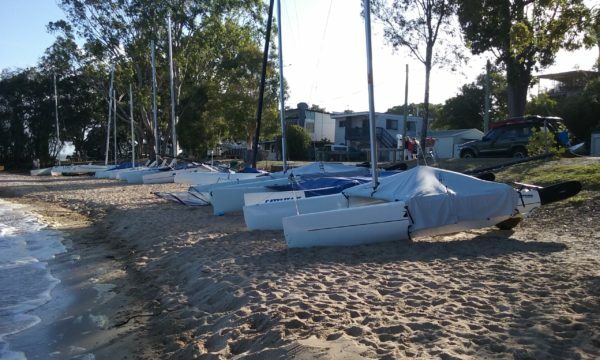 A small sandy beach (it does not appear to have a name) that is perfect for launching small sailing dinghies and kayaks is about 70 metres east of Aqua Marine. The beach is protected by bollards so you can not drive a car down to the beach. The bollard spacing is only 1.6 metres wide, limiting the size of boats that can be launched. Our Sabre, Sabot and Minnow fit through the bollards; our MG14 is too wide. Most catamarans would also be too wide. Rocks are to the south of the beach and a seam of rocks runs south-east from the point about 20 metres into Lake Cootharaba. Make sure you are beyond the rocks before putting your centreboard down! It is possible to walk your boat in between the two groups of rocks, turn left and hop on your boat without touching any rocks. We tend to walk our boats over the seam of rocks and hop on from there — the water is probably waist deep at that point. 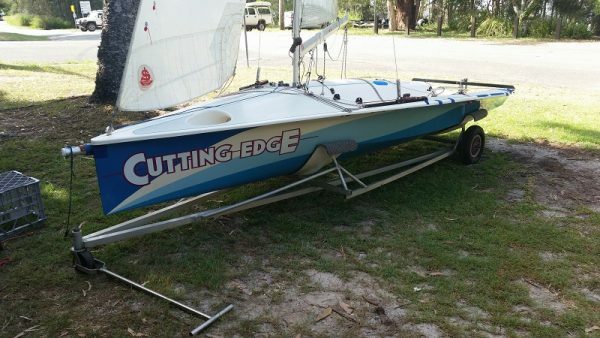 Likewise, when returning to shore, make sure you do not leave your centreboard down and sail right up to the beach! My girls have been taught to turn their boats into the wind and hop out before the seam of rocks. 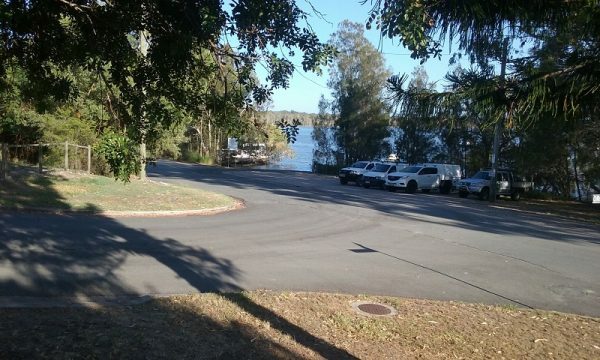 The local concrete boat ramp is about 50 metres west of Aqua Marine. 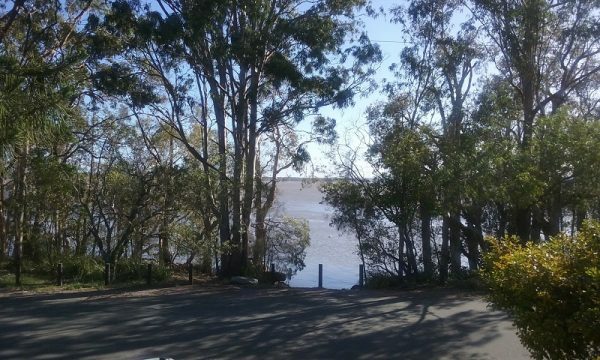 The boat ramp is visible from the deck of Aqua Marine providing hours of pleasure watching the huge variety of craft come and go! If you have a power boat, a large sailing dinghy or trailer-sailer, the boat ramp is the best place to launch. Many large sailing dinghies and catamarans launch from the dirt ramp area beside the concrete ramp. I have also seen people launch from the boat ramp, then spend the day sailing to and from the sandy beach on the other side of Aqua Marine, returning to the boat ramp to pull the boat out of the water. The concrete boat ramp is at a very shallow angle. At the end of the boat ramp is a large patch of very soft mud where power boat propellers have chewed up the bottom. You can walk either side of the mud patch and be on relatively firm bottom. A number of large submerged rocks are to the west of the boat ramp — you will often see pelicans standing on some of them! If you follow the channel markers out from the boat ramp you should be fine, but it does stay shallow for quite some distance from shore! Kayaks can be launched directly in front of Aqua Marine, but you will need to carry them down a rocky bank to the lake. The water is more than deep enough for a kayak and there are no underwater hazards that I am aware of once you leave the shore. 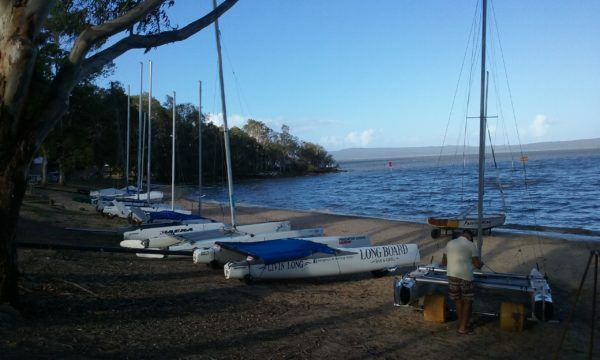 Main Beach is on the southern side of Boreen Point and is where Lake Cootharaba Sailing Club sails from. Main Beach is about 300 metres from Aqua Marine following the road. 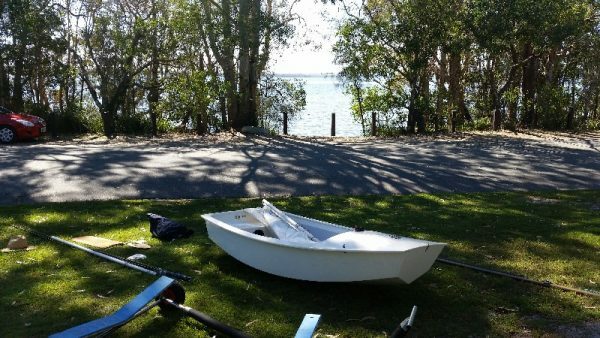 When we are sailing with the sailing club, we often roll our boats on their launching dollies along the road to Main Beach. Powerlines cross the road in a couple of places and there are numerous overhanging trees if you are planning to roll your boat down with the mast already up. A seam of rocks runs parallel to Main Beach — it is marked at either end with underwater obstruction signs. A cluster of rocks is also to the south of the beach, with a number of submerged rocks also to the north of the channel markers at the northern end of the beach. The best idea is to simply launch your boat and wade past the underwater obstruction signs, boarding in waist deep water from there. Aqua Marine is available for holiday rental through Boreen Point Real Estate. 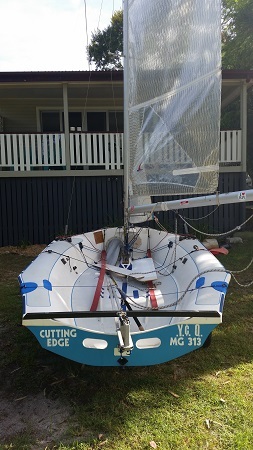 This entry was posted in Aqua Marine, Sailing and tagged Aqua Marine, Boreen Point, Lake Cootharaba, Sabot on 24 January 2017 by Rex.